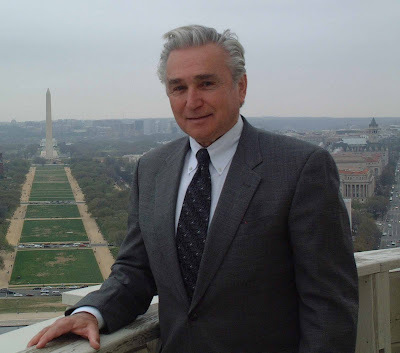 The New York Green Advocate: Standing Up To The Man For U.S.
As a New York State legislator for almost 20 years, Maurice Hinchey wasn't afraid of taking on General Electric (G.E.) to clean up PCBs their factories dumped into the Hudson River. This seems all the more meaningful considering the news that exploded in the media last week about fish oil pills being laden with PCBs. What's so disturbing about PCBs in fish oil pills isn't just that the fish are absorbing PCBs because waterways are so contaminated, but that there is now a lawsuit claiming that companies selling fish oil supplements are knowingly selling contaminated merchandise. This is something that maverick legislators like Maurice Hinchey won't abide. I wouldn't be surprised if sometime in the near future Congressman Hinchey, or one of his colleagues on Capitol Hill, begins to investigate this issue. 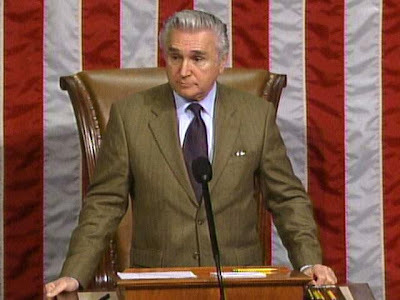 In 2007 Maurice presides over the House floor from the Speaker's chair as the House debates the first 100 hours energy bill which included a provision that the Congressman helped author to close a loophole that has allowed energy companies to avoid paying royalties to the federal government for oil and gas taken from publicly-owned coastal waters. The measure passed. I had the privilege of getting to know my Congressman (Hinchey) as part of organizing "The Forum on the Future of Gas Drilling in New York" that will take place this Monday, March 8, at SUNY New Paltz. The closing keynote will be given by Congressman Hinchey--a graduate of the University. The Congressman is at the forefront of the gas drilling issue in the United States. Through Congressional action, he is leading our nation towards correcting a 2005 loophole (the "Halliburton Loophole") in the Safe Drinking Water Act that exempts gas companies drilling for natural gas from basically all environmental oversight. Maurice Hinchey has a distinguished legacy of being the man for the common man. Decades ago, while serving as Chairman of the Environmental Conservation Committee for the New York Assembly, the committee conducted a successful investigation into the causes of "Love Canal"--the nation's first major toxic dump site. This post is the first in a series of reports I will write about my Congressman. For now, make sure you all read up on the issue of Gas Drilling and what Congressman Hinchey has to say about it. Before I leave you, I want to make clear that my impression from talking to Maurice Hinchey is that he understands the seriousness of both energy security and economic security of the state--(New York)--he represents. He knows we need income and jobs and a major boost to our economy. He is not against gas drilling per se. He just wants this industry to be transparent and regulated with the oversight necessary to prevent pollution of the very land we live in. Congressman Hinchey is putting real green money into helping New York State. For instance, he was a key participant in the 2007 creation of The Solar Energy Consortium in Kingston. On Friday, March 5, Congressman Maurice Hinchey (D-NY), New York State Assemblyman Kevin Cahill (D) and The Solar Energy Consortium (TSEC) President and CEO, Vincent Cozzolino, announced that solar manufacturer, Solartech Renewables, will relocate its operations to Tech City in Kingston and create 100 new jobs within one year. 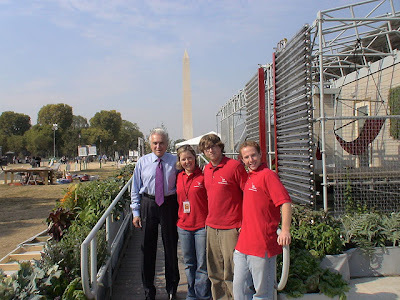 2007 Congressman Hinchey with members of Cornell University's Solar Decathalon Team on the National Mall. The Congressman's office announced: "Solartech Renewables' move to Tech City was made possible due to a variety of funding sources, including federal money Hinchey personally obtained from Congress and various sources of state funding, as well as extensive assistance from TSEC." Congressman Hinchey said: "Over the last three years, we've developed a strong core network of solar companies in the Hudson Valley. Solartech Renewables is a company with a bright future that will create 100 jobs in the Hudson Valley over the next year and help further our effort to develop the Hudson Valley as a solar energy research, development and manufacturing cluster,"
Besides trying to keep New York environmentally sound and make it a national center for renewable energy business and technology, another battle our Congressman is taking on to help not only the people he represents in his Congressional district in upstate New York, but also the rest of our country - is the housing and financial crisis that has yet to really be rectified. When I spoke to Congressman Hinchey last week, I asked him about Congressional legislation he is co-sponsoring to extend the first time home buyers tax credit, set to expire April 30, till the end of 2010. He reported that a few weeks ago he and Congressman Cummings (D Maryland - 7th District) sent a letter to President Obama and Federal Reserve Chairman Bernanke supporting the continuation of this and other key programs affecting homes and real estate that are set to expire. I asked: "What has the response been from the Administration?" Congressman Hinchey expounded: "We haven’t gotten any response back yet. I’m glad you mention that because this is something that I strongly support. And, it’s something that we are doing everything we can to try and maintain it. The problem with the loss of homes has a major effect on the economic circumstances that we are dealing with. And, some of the manipulation of mortgages was one of the reasons that economic decline came about so quickly and so badly. So, these are things that really need to be dealt with. And, is something else we are focusing our attention on and trying to get something done constructively to deal with it." I have no doubt that if anyone can get to the bottom of mortgage fraud, or pretty much anything else worth fighting for, it'll be Maurice Hinchey. I look forward to keeping you up to date on other things he is doing. One such effort I hope to tell you about is the Congressman's quest to preserve 9.1 million acres in Utah. Through his incredible Red Rock Wilderness Act, he is working to maintain Federal land for the benefit of the American people. This reminds me of what legendary oceanographer and explorer Sylvia Earle is accomplishing with the creation of national marine life sanctuaries to protect our oceans. Look out for Part 2 of my continuing report about Congressman Hinchey in the coming months.